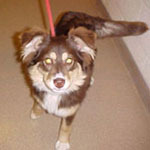 Coco is a female six month old Australian Shepherd puppy who is coming to us from a high volume shelter in Ohio. Mikie is about 4 months old and a very smart little boy. He was picked up with his sister Racie. Hope is a wonderful girl. She gets along with other dogs. She is about 3 years old and weighs about 50 pounds. 4/12/05 UPDATE Hope is good around cats. 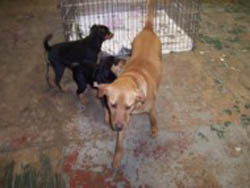 She does not soil her kennel so we believe she is housebroken and comes when called. Joanie is approx. 12 weeks old and weighs about 15 lbs. We're not quite sure what she is but she's beautiful. She is very frightened at the pound and I don't think she has ever had anybody be nice to her. She is starting to warm up to us and will give you kisses if you sit with her. She will need to learn how to walk on a lead. 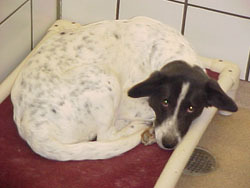 Since Joanie is so timid she will not be placed in a home with small children. She needs a nice quiet home and somebody to love her. 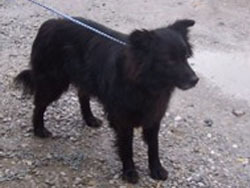 Janice is a young dog who has already had a litter of pups. She has the softest fur, like a puppy. She was surrendered to a high volume shelter where she would have been euthanized had it not been for a dear friend of Save A Dog, who rescued her and the pups. She is mild energy inside but likes to run and play outside. She is really an awesome dog and just so pretty. 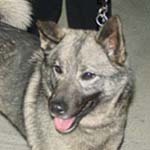 Samantha was adopted as a puppy and returned as an adolescent due to a change in the family schedule. 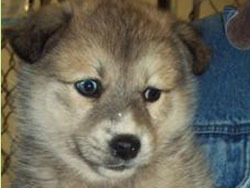 This is one of Moonshine's pups. More information coming. What a beautiful, little lady! She weighs approximately 20lbs, is completely housebroken and walks great on a lead. She gives the most gentle kisses, loves to cuddle and will do just about anything for a good back scratching. 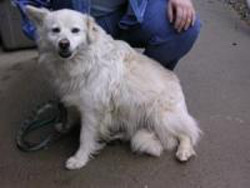 Kelsey's owner can no longer care for her due to medical reasons so she asked us to help find her another loving home. 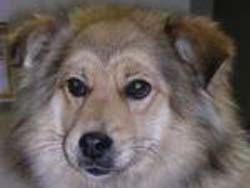 Marlise is the very sweet corgi mix who is mama to 4 puppies. She had her pups in an unheated shed in the snow and was taken in by a nice lady named Marlise, so we'd like to keep that name for her. She is a special dog, a good mama to her pups, and very quiet. She is shy when you meet her, but soft and gentle. A quiet household would help her to flourish. You won't find a sweeter dog if you have the patience for a shy one. 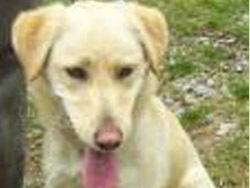 Maggie is a very active 9 month old yellow lab mix who was turned in by her owner. She was probably a Christmas puppy who outgrew her cuteness. She already knows some commands. 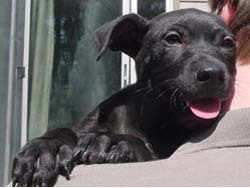 Maggie was transferred to Medfield Animal Shelter where she was adopted by a family who loves her a lot. Eric is about 3 months old. He is a very sweet boy. What a sweetheart this little one is! She’s active and inquisitive. 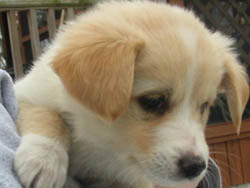 She, Archer & Tawny are from the same litter (7 wks old) and are the most sweet natured puppies! Their tails never stop wagging and they love to cuddle, and then there’s playtime….They are learning housetraining and know what to do when they go outside! Just have to be taken out frequently. Training is mandatory. If you are applying for this puppy, please be a stay at (or work at) home person and have plenty of time and love to devote to her as she will return that love and devotion in kind! Kaylee will make a loyal and loving companion! 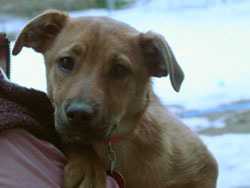 Kaylee will be ready to go to her forever home after she is spayed. Misty is an 8 month old female Pit Bull terrier mix who just came to us from a local pound where she was picked up as a stray hiding under a parked car. She is in a foster home now and is doing great. She loves to play with other dogs and absolutely adores people. You can see her giving a kiss to the person at the other end of the leash. She plays using her paws, like a boxer. 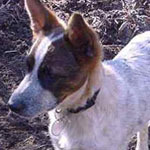 Misty is full of fun and has lots of energy. She runs like the wind, leaping over the other dogs in the household, and just having a ball. She has had no prior training but we have started working on her with basic obedience. She's already learning not to jump on people, but she still does it when she's excited. She is going to make the right owner an awesome dog. We will provide spaying, vaccinations and will consider microchipping as we don't want her to ever end up in a shelter again. Please be an adult home or one with teens who has the time for training and understanding of the breed. She appears to be housebroken (no accidents and pees as soon as she goes out), but we are not sure; with leash training, she would be a great jogging partner, and seems to be complacent and well-mannered when left alone after exercising. 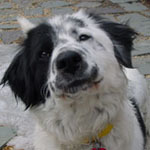 Misty will be at our Meet & Greet this Sunday, March 20. 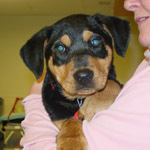 Racie is about 4 months old and is a very loving girl. She was picked up with her brother Mikie. Racie is schedule to arrive the weekend of 04/02/05. She will be at our next Meet & Greet on 04/03/05. Tawny is sweet as can be, as are her litter mates, Kaylee & Archer. She is 7 weeks old as of 3/25 and approx. 7 lbs. They are all the most adorable & sweet natured puppies! Their tails never stop wagging and they love to cuddle, and then there’s playtime….They are learning housetraining and know what to do when they go outside! Just have to be taken out frequently. Training is mandatory. If you are applying for this puppy, please be a stay at (or work at) home person and have plenty of time and love to devote to her as she will return that love and devotion 10 fold! 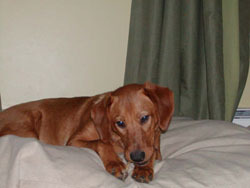 Tawny will make a loyal and loving companion! 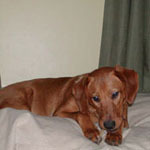 Tawny will be ready to go home after she is spayed. 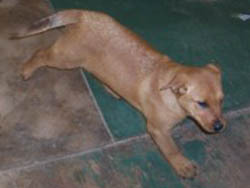 Tessa is a four month old very petite WV mutt. 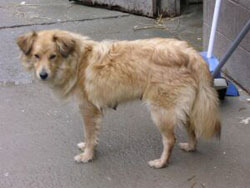 She appears to have some Shepherd or in her, but she will not get too big as she has dainty paws and a small size. She was found by the side of a busy road amidst her dead siblings and mother who had all been hit by cars. Someone said they were thrown from a car. She is shy at first as she probably never had a home to call her own. 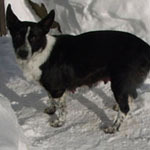 A fenced in yard would be best for an inexperienced adopter, or leash work with someone who has leash training experience. She is affectionate as they come, but just a spaz in the house. She was spayed on 3/25. 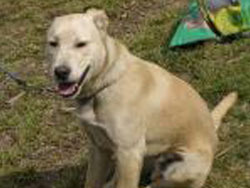 Rinty is a golden retriever/lab mix who is just awesome. He has that friendly "Golden" personality and just loves everyone. He hardly ever jumps up and is an all around quiet boy inside the house, but loves to chase a ball or run with you outside. He craves attention but is not demanding. I can't believe he hasn't been snapped up already. This is a dream dog!!! He is about two years old. Baby is a very affectionate lap dog. Her tail is constantly wagging. 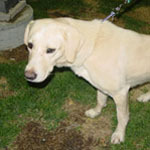 She appears to like everyone and is friendly with other dogs. She knows sit and lie down and is housebroken. She'll make someone an awesome little companion. Black Eyes is 7 months old whose dad was a beagle and mom mom is a poodle fox terrier mix. He weighs about 15 pounds and is nearly full grown. He is a good boy, is pretty quiet, not too mischievous, a wonderful companion who likes to chase balls or just walk beside you. What's not to love! In the second picture, he is the one on the left. Pictures don't do him justice as he is so cute. Housebroken, not a leg lifter. He would be too much for young kids or older people as he has the terrier in him, but he is a riot to watch. He is full of the cutest antics! 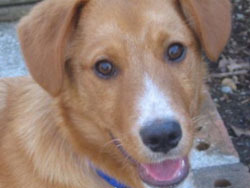 This adorable male cardigan corgi mix pup is 5 months old. 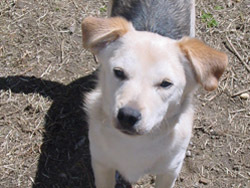 Dusty is is a very happy, affectionate puppy, a lover, not a fighter...he is very non-chalant with other dogs, happy to be in a crowd, but so wanting his person's attetion. Likes to give kisses. He has had no accidents so far. Housetraining will have to be enforced; this puppy will require someone to take him out frequently not only for exercise,but for potty time. 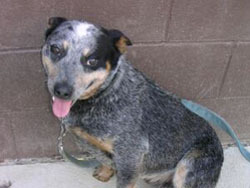 He is not yet neutered, but will be prior to going to his forever home. Please note: Corgis tend to be "herders" so not appropriate for homes with small children. 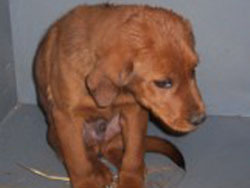 Please read our guidelines on puppies/adopters for puppies. This puppy needs lots fo socialization and training class to become an integral, well behaved part of your family! He cannot be left more than 4 hours a day. Please do not apply if you work all day and he would be left alone. .
Ebony is about 2 years old and weighs about 40 pounds. She is a very sweet girl that loves attention. 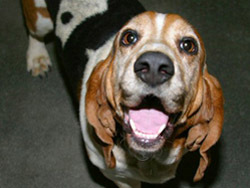 Hank is very surprised to find himself in a municipal shelter. He is disappointed that his people have not come for him, but he is resourceful and resilient young fellow who is determined to find a deserving family for himself. 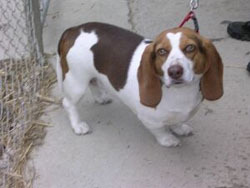 Name: Hank Height: 12-13 inches Weight: 60 pounds Age: One year Ethnicity: Purebred Bassett Hound Health: Excellent. Neutered. Heartworm negative. Current on vaccinations. Temperament: Loves people. Likes other dogs. Tolerant of cats. Special skills: Housetrained. 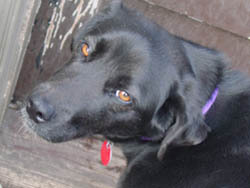 Joely is a doll baby who is very calm and quiet but follows you around wanting attention. She just finished weaning a litter of pups. She had been living under an old shed and would love a real home. She walks very well on a lead and is good with other dogs. She is approx. 2 years old and weighs about 35 lbs. 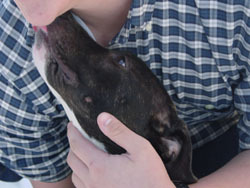 Joely doesn't mind kids but scares easily so she shouldn't go to a home with small children. Rose is approx. 18 months old and weighs about 40 lbs. She's very friendly and walks well on a lead. Good with other dogs. 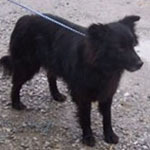 Rose has a very silky soft coat that's wonderful to pet. 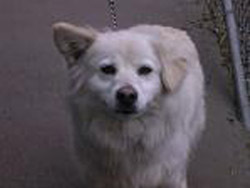 Sam was adopted as a puppy and returned as an adolescent due to a change int he family schedule. More information soon. 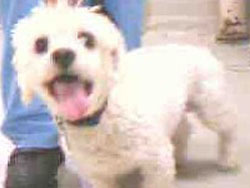 Scooby is a nice, friendly little bichon frise, looking for a new home.He is 4 years young and will make someone a gret companion. Better pictures and more information coming soon when Scooby arrives at his foster home and is evaluated further. This sweet little girl is only about 7 wks old. 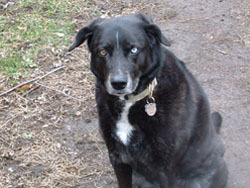 Her mommy is Joely, the sheltie mix and her daddy was a neighbor's Husky. She has 1 blue eye and 1 green. She is a little scared since she's not been around people so she needs to go to a quiet home with no small children. For now she feels safest with her mommy but she is starting to follow the other dogs at her foster home. Wiggles is 7 months old and came in with his brother Black Eyes. 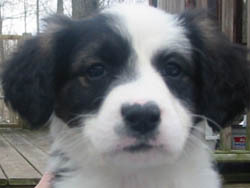 His dad is a beagle and their mom is a poodle fox terrier mix. He weigh s about 12 pounds and is just about full grown. Wiggles is just a love. He is so affectionate and wonderful. Good in his crate, doesn't lift his leg in the house. Just neutered and ready for a permanent home. 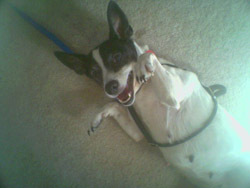 Because of the terrier in him, we he would be too much for young kids or older adults, but anyone in between is in for a lot of love and laughter. His picture doesn’t do him justice as he has curly fur and penetrating eyes. 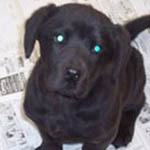 Boomer is a little cutie pie puppy who seems to be around 10-12 weeks old. He came from a high volume shelter where he was overlooked for adoption. He seems to have been living outside prior to his shelter life so we'll have him seen by our vet. He deserves so much better as he is a good puppy. He might have some boxer or pit in him so we're listing him as a pit mix. He is crate trained and pretty good in the house, knows how to use the doggy door. Heather is a sweet gorgeous girl who's family moved away and left her behind. She's approx. 35 pounds. Heather gets along well with dogs her own size but she doesn't like dogs bigger than her that try to play, it scares her. She's very friendly and walks well on a lead. She is a real people dog and a perfect little companion dog since she'll follow you anywhere. Mason is approx. 10 months old and weighs about 35 lbs. He's friendly and energetic but walks very well on a lead and sits when you stop. 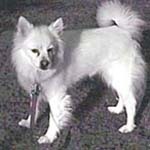 He likes playing with other dogs but has lots of energy so his playmate needs to be active. 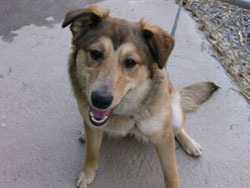 Mason is neutered and ready for a home! 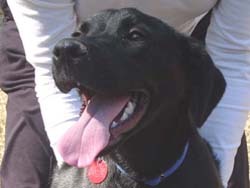 Molly is a 7 month old black lab retreiver mix. 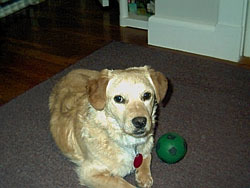 She is a nice dog who bonds well, loves to fetch, loves stuffed animals. She's quiet in her crate and seems to be housebroken. She has a bit of a cough so we have not spayed her yet. She came from a rural environment so all the city noises and things are new to her. She would flourish with the right person who can socialize her while she's young. Moonshine lives up to her nane--highly potent, active and you won't be able to live without her! She is very active outdoors and needs lots of exercise, but quiet inside; she is still somewhat chewy so she will need lots of chew toys. She is mouthy when excited so a family without little kids would be best. Loves other dogs/ignores cats-likes all people all sizes. Seems to be totally housebroken and crates well. Has no food issues. Still jumps up to greet you (actually puts her front legs around yours like a hug, which is adorble); Not used to a lead yet, but a quick learner and with training will be perfect--and she is so gorgeous with the most expressive amber eyes ever! 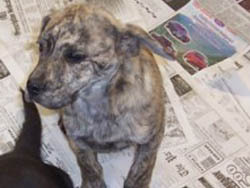 A young girl who will make a great companion. Muffy is about 35 lbs. and approx. 1 yr. old. She came in with her buddy Fluffy when the home they were at was condemned. She's a lovebug!